Ruskin went down from Oxford and for the sake of his health travelled to the Continent with his parents from 25 September 1840 until 29 June 1841. 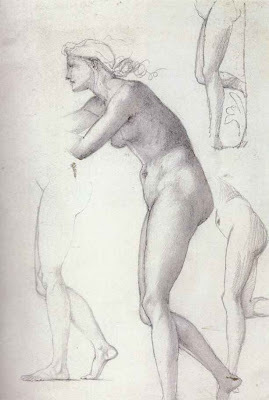 He visited Florence and the Uffizi and sketched the statues there, noting how refreshing it was to see the originals and that the Venus de'Medici was 'one of the purest and most elevated incarnations of woman conceivable'. The Garden Court, one of the four large paintings collectively known as The Briar Rose series. Their exhibition at Agnew's in 1890 was an enormous success, and effectively marked the climax of Burne-Jones's career. 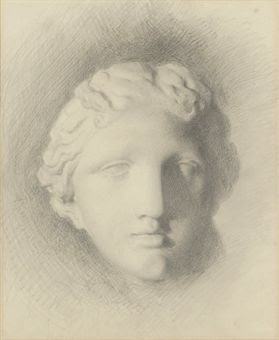 They were bought by Alexander Henderson, later first Baron Faringdon, and installed at his country house, Buscot Park, Oxfordshire, where they remain. 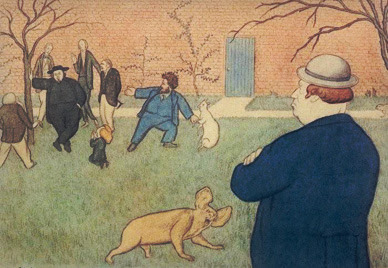 The caption is about George Meridith exhorting Rossetti to come out for a walk. But who is that looong necked model ? 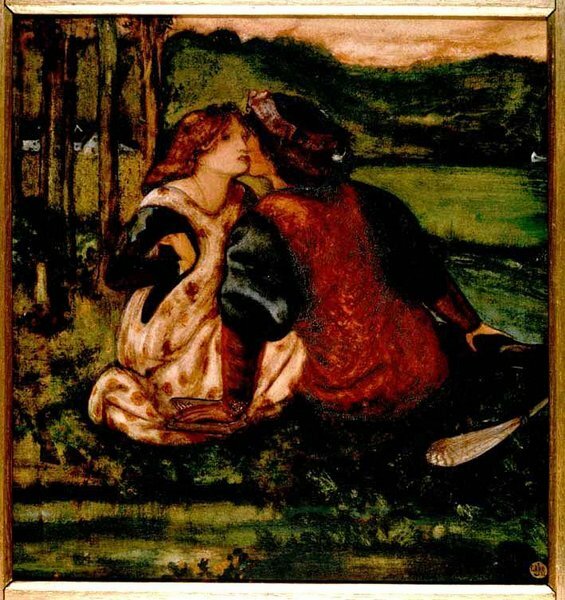 This painting illustrates a poem written by Rossetti in about 1850. 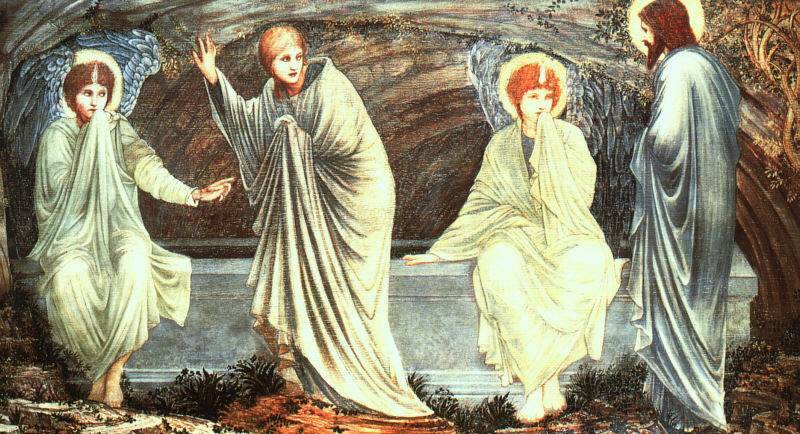 It tells the story of a damsel (a young woman or maiden) who died young and went to heaven. There she pined for her earthbound lover, waiting for him to die so they could be together again. 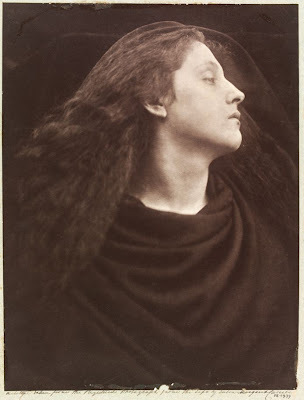 The model was Alexa Wilding, a dress maker of striking looks and an ambition to have a stage career, but she looks a lot like Jane - or perhaps all Rossetti's models look a lot like Jane! 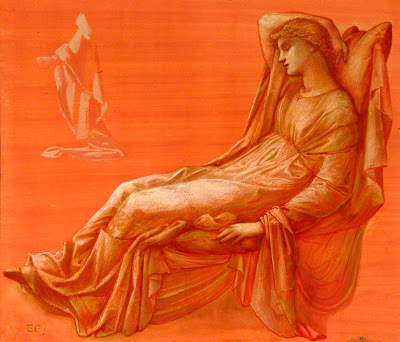 The painting originally belonged to Frederick Leyland and it was hung in the living room of his house in London next to 'Proserpine' (1877, Tate Britain) and among extravagant gilt furniture. The voluptuous frame may well have been particularly designed to match the overall style of Leyland's drawing room. 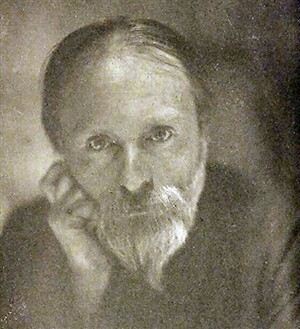 Lord Lever, who in the latter part of his life had learnt a lot more about art and become a keen collector of Pre-Raphaelite artists, bought the painting in 1922. 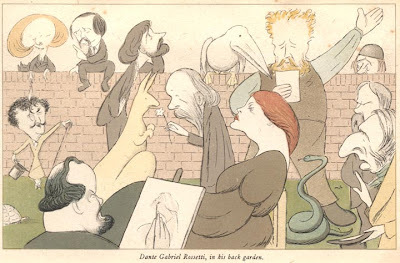 Max Beerbohm, Dante Gabriel Rossetti in his back garden, 1922. We see Rossetti sketching Fanny Cornforth and clockwise from Rossetti - J. M. Whistler, A. C. Swinburne, Theodore Watts-Dunton, W. M. Rossetti, William Morris, William Bell Scott, William Holman Hunt, John Ruskin and Fanny Cornforth, Sir Edward Burne Jones presents a flower to a kangeroo. 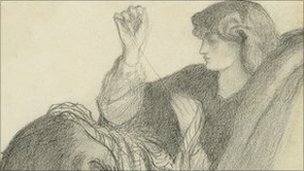 Christina Rossetti, Sir John Everett Millais, Thomas Woolner and F. G. Stephens are missing.See J. Rosenfeld, The Pre-Raphaelite 'otherhood' and group identity in Victorian Britain. All references are taken from John Christian, The Oxford Union Murals, Chicago and London, The University of Chicago Press 1981. In The Education of Arthur Merlin is seen summoning up for the boy the ghosts of his ancestors to prove his royal lineage. The paraphernalia of wizardry, an hourglass, a skull, books, and some arcane diagram, appear at his feet. The ghosts are just visible behind. The subject does not occur in Malory but is found in Spenser’s Faerie Queen (bk. 1, canto 9, stanza 5). 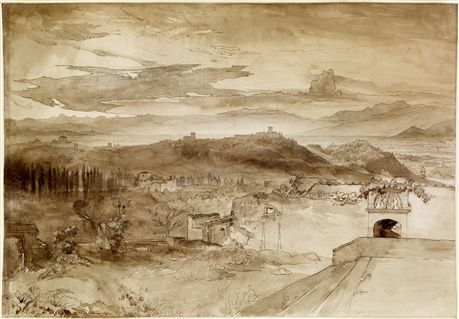 It is interesting to recall that Spenser was one of the sources of the subject matter permitted to artists entering the Houses of Parliament competitions. 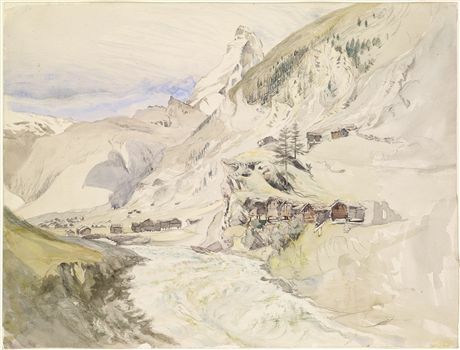 Riviere may have hit on the verse while searching for suitable themes for his entries to these competitions. 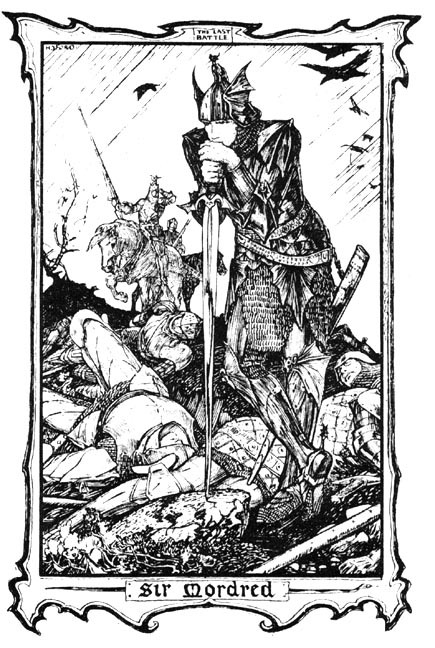 King Arthur’s First Victory with the Sword is another early subject in the cycle. 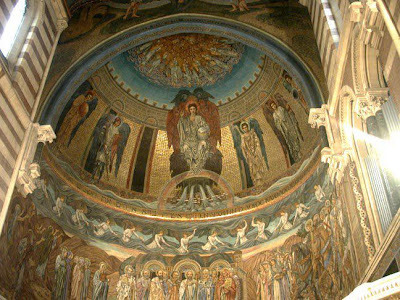 After he had proved his right to the throne by pulling the miraculous sword out of the stone and anvil, Arthur was crowned at Caerleon and held a great feast at Pentecost. To this he invited his rivals but they turned upon him and he was forced to fight. The mural shows him overcoming his enemies by using the miraculous sword as Merlin advised: ‘Syr, fyghte not with the swerde that ye had by miracle til that ye see ye go unto the wers; thenne drawe it out and do your best’. To save any confusion, it should perhaps be added that in describing the battle Malory mistakenly refers to the sword as Excalibur, the sword Arthur was later to receive from the Lady of the Lake, as shown in Pollen’s mural. The design follows Malory closely. The King is seen punting himself toward the sword, which is brandished above the surface of the lake. Behind him in the boat stands Merlin, and to the left the Damsel of the Lake, who gives him the sword. A flight of waterfowl, a detail highly praised by Patmore, is seen overhead, and to the right Arthur’s and Merlin’s horses are just visible, standing by the shore. In King Arthur’s Wedding Feast, the King and Guinevere, his bride, seated at the Round Table after their marriage, surrounded by their knights, are startled by the ‘adventure’ Merlin had promised would take place before the feast began. A white hart, pursued by a ‘brachet’ or small hunting dog, bounds through the hall, inviting the knights to follow and see that ‘thes adventures be brought to an ende’. According to Malory, Nimue was ‘a lady of the lake’ brought to King Arthur’s court at Camelot by King Pellinore. Merlin ‘felle in dotage’ on her and taught her magical crafts, and when she left the court, he followed. They went to Cornwall and there, growing tired of his attentions and being ‘aferde of hym for cause he was a devyls son’, she lured him to his death. Using an enchantment she had learnt from the magicians himself, she made him ‘go undir a grete stone’, and ‘wrought so there for hym that he come never oute for all the craufte he coude do’. It is possible that Burne-Jones already knew that the subject had been chosen by Tennyson for the first of this Idylls of the King, composed in March 1856. 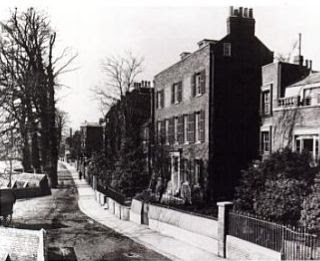 In 1858 he certainly discussed the treatment of the story with Tennyson, whom he met at Little Holland House. He even persuaded the poet to change the name of Nimue to Vivien to suit her ‘modernised and altered character’ (Memorials, 1:182). Like Rossetti himself, however, Burne-Jones was fascinated by occult themes, and in fact returned to the story of Merlin’s death on several occasions, notably in the well-known Beguiling of Merlin, one of the pictures that made his name at the Grosvenor Gallery in 1877. Sir Ewaine was banished from King Arthur’s court because of the treachery of his mother, Morgan le Fay, and with him went Sir Gawaine, his cousin. They fell in with Sir Marhaus, son of the King of Ireland, and in the Forest of Arroy, ‘contrey of stronge adventures’, came across three damsels at a fountain. One was old, ‘three score wyntir of age or more’, one was aged thirty, ‘wyth a cerclet of golde aboute her hede’, and ‘the thirde damesel was but fiftene yere of age, and a garlande of floures aboute hir hede’. The knights were each bidden to choose a damsel to accompany him on his travels for a year, after which they were all to meet again at the fountain. In Stanhope’s rather wooden painting Sir Gawaine alone is seen with the damsels, the youngest and fairest of whom falls to his lot. Her hair wreathed with flowers as Malory describes her, she is seen in the centre acknowledging his salutation. To the left are her two older sisters, and a trickling fountain is just visible behind. Continuing on his way, Gawaine came across a knight, Sir Pelleas, who was in love with a lady, Ettarde. She, however, spurned his attentions. Gawaine, true to his reputation for duplicity, offered to make her love the knight, only to sleep with her himself. Pelleas found them, and although he refused to kill them, he laid his sword across their throats. He swore that he would die of sorrow, but Nimue, ‘the Damesell of the Lake’, cast an enchantment over Ettarde which made her love the knight she formerly hated. Now it was her turn to be rejected, and she died of a broken heart. The mural shows Pelleas turning from her in anger: ‘Away, traytoures, and com never in my syght’ On the left stands Nimue, the Lady of the Lake (who soon claimed Pelleas for her own lover), and the other figure must be the ‘knyght of sir Pelleas’ who also appears in the story. Prinsep departs somewhat from the text in showing Pelleas standing and armed. In Malory he awakes from sleep to find Ettarde by his bed. Rossetti’s mural represents Sir Launcelot’s failure to achieve the Grail because of his adultery with Guinevere. To the right the knight lies sleeping before the Grail Chapel, his shield and helmet handing above him. 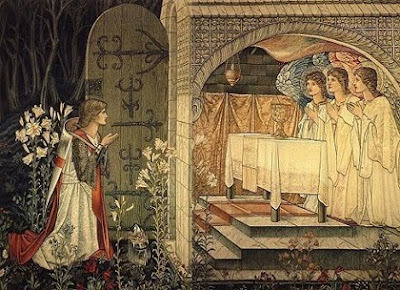 The Damsel of the Grail, clasping the sacred vessel and surrounded by attendant angels, is seen on the left, and between them stands the Queen as she appears in Launcelot’s dream, her arm extended in the branches of an apple tree. The theme of guilty love and its spiritual consequences was one that always had a strong attraction for Rossetti. It found many echoes in his life, and he returned to it again and again in paintings and poems. 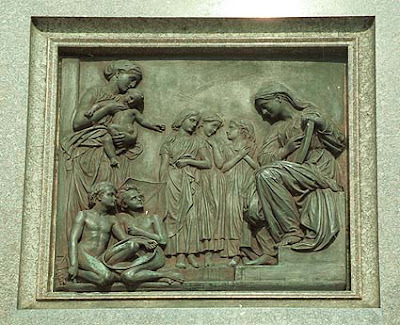 The bold use of symbolism in the figure of Guinevere, based on the well-known imagery of Genesis, is also characteristic. 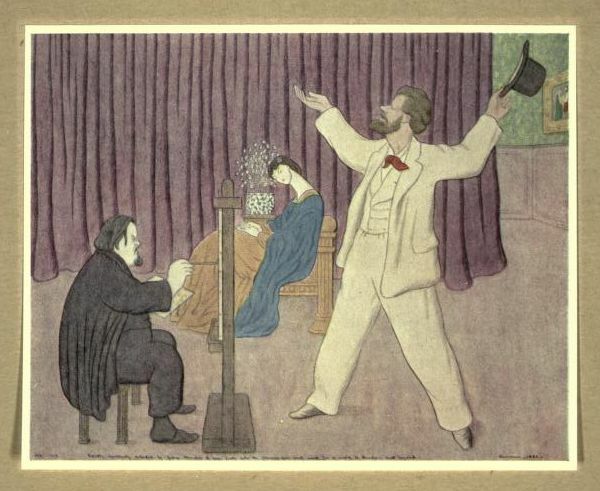 Morris’s mural represents Sir Palomydes’ Jealousy of Sir Tristam. He treated a theme that already haunted him and indeed was to have some reflection in his own life, that of the rejected and despised lover. Palomydes, the Saracen knight who nursed a hopeless passion for Iseult and was condemned to follow perpetually the Questing Beast, is just visible on the left, with appropriate black hair and swarthy skin. 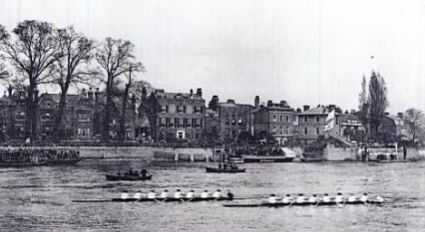 Tristam, his successful rival, embraces Iseult at the right. According to Prinsep, Rossetti told him that Iseult’s head was ‘not human – you must get some nature’, and sent him to make a study from ‘stunner Lipscombe’, the daughter of the Godstowe innkeeper. Her mother, however, refused to let her sit, and so the head remained as it was. Not surprisingly, Morris filled the greater part of his composition with sunflowers and apple trees, his instinctive sense of organic design enabling him to handle these motifs with ease. 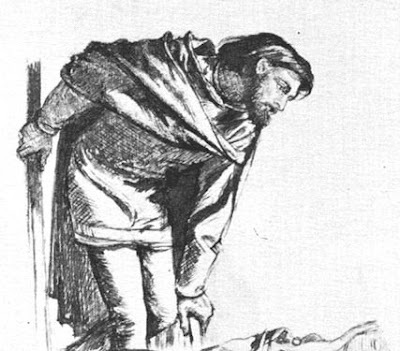 Arthur Hughes’s Passing of Arthur shows the King, mortally wounded in the battle against his traitor son Sir Mordred, received into a barge by the three queens who will take him to Avalon, there to recover against his future coming. At the left Sir Bedivere, the only Knight of the Round Table to survive the slaughter, throws the King’s sword Excalibur into the lake where it is received by a mysterious hand. To contemporaries this would probably have been the most familiar subject in the series since it had been treated by Tennyson in his poem Morte d’Arthur, first published in 1842. Indeed Hughes probably had this in mind. Like Tennyson, he pictured the scene taking place at night, and he showed the arm exactly as the poet described it, ‘clothed in white samite, mystic, wonderful’ (This touch, although found in Malory’s account of the sword’s discovery, is absent from his description of its return to the lake). 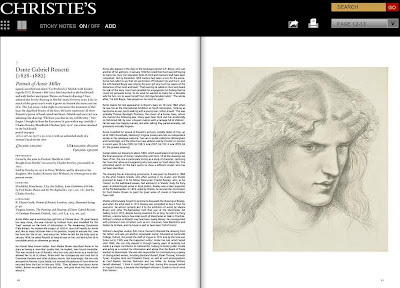 Hughes must also have known Rossetti’s treatment of the subject in his illustration to The Palace of Art in the recently published Moxon edition of Tennyson, although there is only a general resemblance between the two compositions. The mural probably owed most to the success Hughes had recently enjoyed with another historical night scene, an illustration to Keats’s Eve of St Agnes, which he had shown at the Royal Academy in 1856. Sacred and Profane Love. 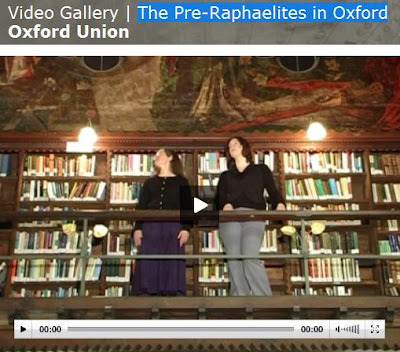 The Oxford Union Murals and the Holy Grail Tapestries, in William Morris. Centenary Essays, edited by Peter Faulkner & Peter Preston, Exeter, University of Exeter Press 1999, pp. 125-132, in particular pp. 125-128. 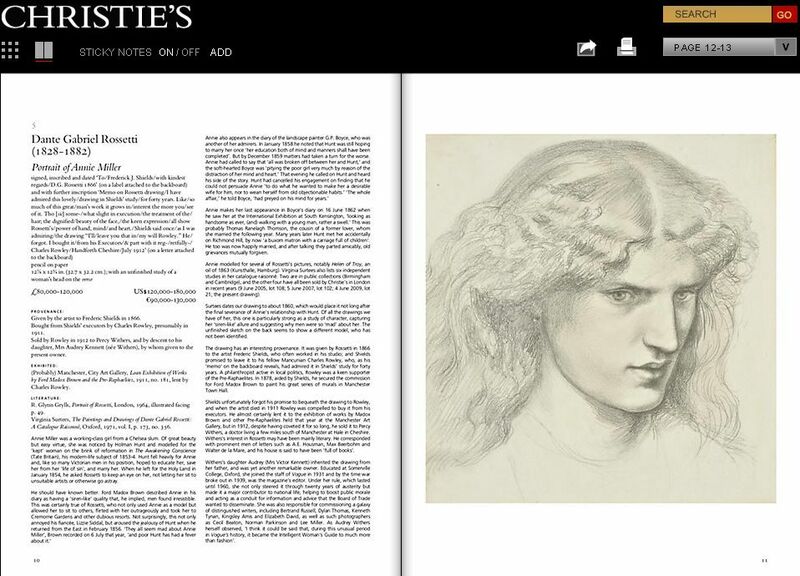 Mrs Wyndham Milligan; Sotheby's, Belgravia, 29 June 1976, lot 236 (sold £480). with The Maas Gallery, London, where purchased by the present owner. 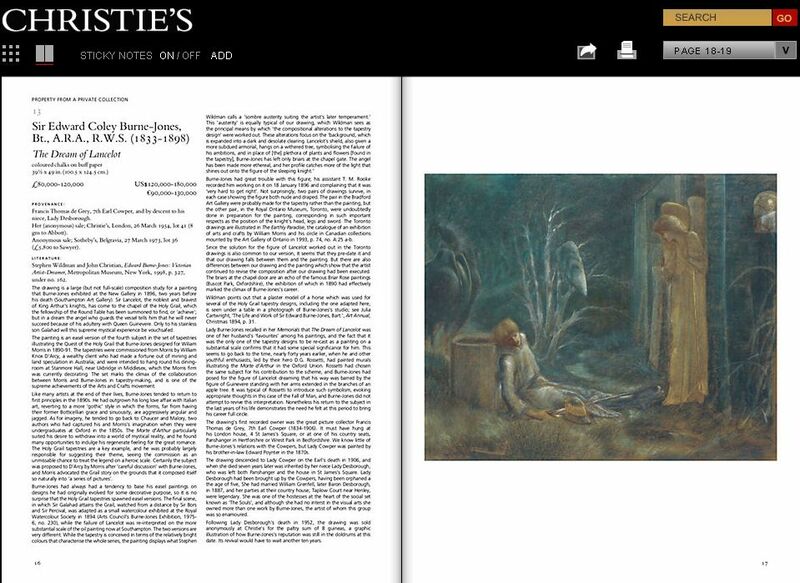 F. MacCarthy, William Morris, London, 1995, p.255, illustrated. 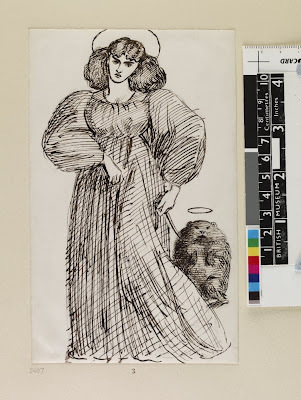 The present drawing was one of a group of sketches and caricatures from the collection of Burne-Jones's model and muse Maria Zambaco. An exceptionally beautiful member of the London Greek community, his affair with her began in the late 1860s and lasted about three years. The impact of the affair on Burne-Jones was profound and his drawings of her have a sadness and air of unearthly beauty about them. 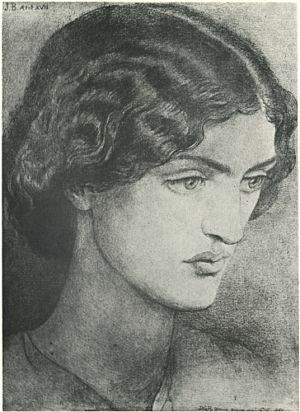 The affair between Burne-Jones and Maria Zambaco can be compared to Rossetti's relationships with Lizzie Siddall and then with Jane Morris, the wife of William Morris, pictured here. 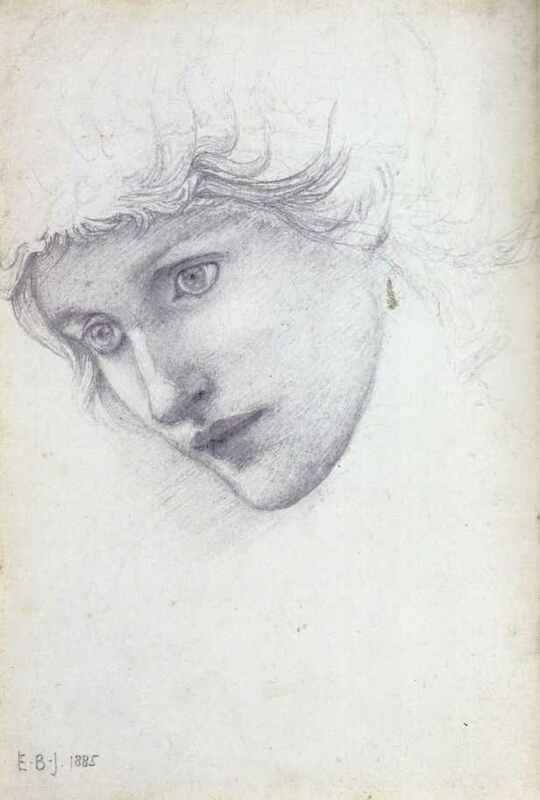 Like Rossetti, Burne-Jones saw Maria as symbol of his muse as much as a reality. 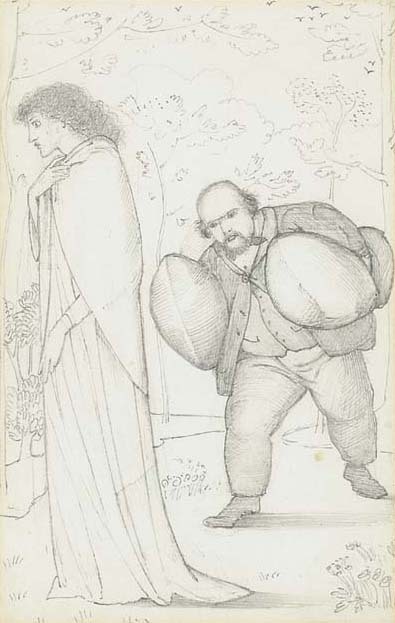 In the present drawing Burne-Jones, with his characteristic trait of satire, has depicted a rather portly Rossetti hurrying to the attention of a rather fey Jane Morris. Rossetti and Jane first became close while she was sitting for the figure of Queen Guinevere in the Oxford Union murals. 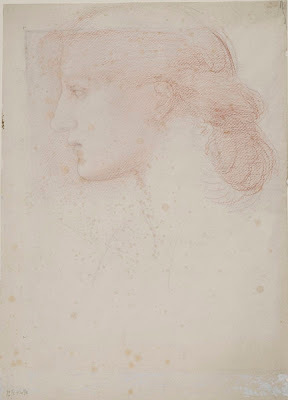 However Rossetti was already engaged to Lizzie Siddall, who he married in May 1860. 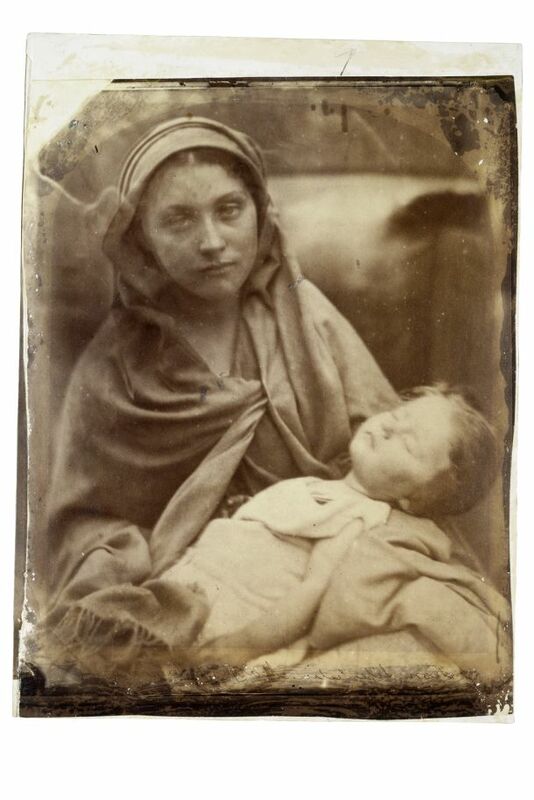 However not long afterwards in February 1962 Lizzie died of a laudanum overdose. 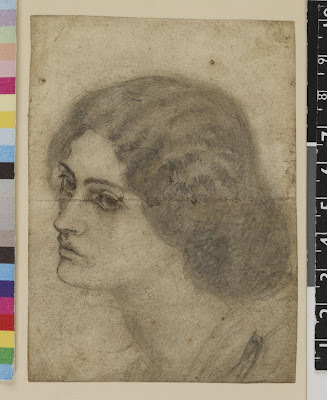 William Morris at this time was heavily wrapped up in his work, so the stage was set for a renewal of Rossetti and Jane's Morris's former intimacy. In 1865 she was sitting to him for drawings and by 1868 he was working on a formal portrait. 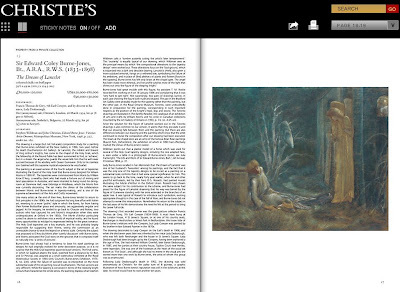 She was the model for his striking pastel of 1869, Pandora, Christie's, London, 14 June 2000, lot 14 (sold £2,400,000). 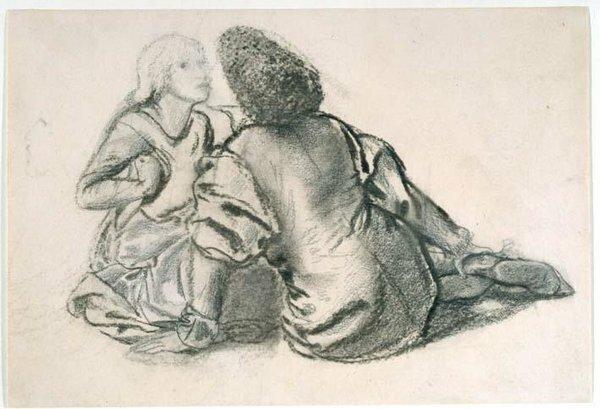 Between 1870 and 1874 they contrived to spend as much time together as they could at Kelmscott Manor, the house which Morris and Rossetti had taken joint tenancy of. However Jane later maintained that the affair remained at the level of passionate romantic attachment rather than anything more physical. 8 3/4 x 6 3/4"
A study for the Godhead Fires, the third painting in the Pygmalian series. A study of Laura Lyttleton as a mermaid for The Depths of the Sea. Exhibited in 1886, the year she died in child birth. BJ was devastated by her depth and designed her memorial. 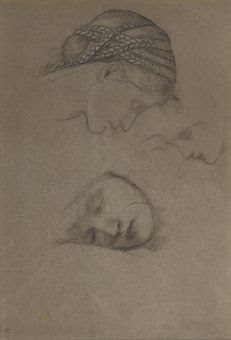 Study for 'Iseult on the Ship' by William Morris, c. 1857. 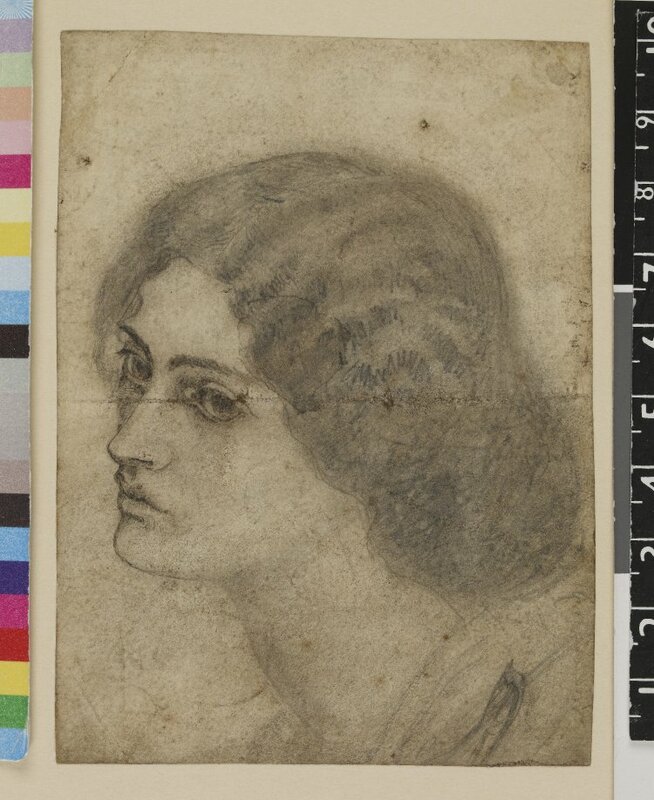 This is the only surviving drawing by William Morris of his wife, Jane.